Crazy Chameleons is a fun slots game where you must help the Chameleons to win the lizard surf competition, but it always seemed to be missing something. Click here to play! It's a great game, with a generous top prize, but it really needed a bonus to help set it apart from the rest of the 5-reel slots. 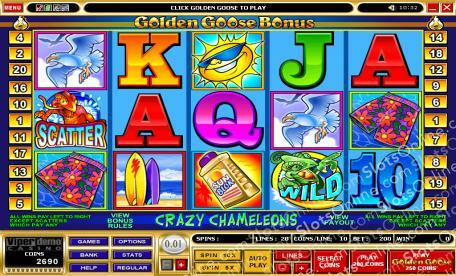 Thankfully, the Microgaming designers thought so too and made the Golden Goose - Crazy Chameleon slots. For the most part, it plays just like the regular Crazy Chameleons game. Why ruin a winning formula after all? Where it differs is that players may wager a special Golden Goose bet to get a chance of playing one of the Golden Goose bonus games. Grab your surfboard and dive back into the waves to help the Crazy Chameleons. This time, though, you'll have to keep on the lookout for a Golden Goose as well if you want to get the most out of the Golden Goose - Crazy Chameleon slots! The Red Chameleon symbol is a scatter symbol that pays out on the total bet when 3 or more land on the reels. The Green Chameleon symbol is wild and substitutes for any symbol other than the Red Chameleon. The Golden Goose bonus has a chance of being triggered randomly anytime the reels are spun on the Golden Goose bet. There are 4 possible games to play. The first is the Golden Egg Bonus, in which players are awarded a golden egg that contains a prize value of up to 2,000 coins. The second game is the Golden Reels Bonus, in which eggs are displayed on all 5 reels for the player to choose 1 from each reel. The third game is the Money or the Egg Bonus, in which players can choose a random prize value by choosing the money, or a random number of free spins at a random prize multiplier value by choosing the Egg. The fourth game is the Pick a Card Bonus, in which the player picks a card from 5 in order to win up to 11 spins with a 6 times prize multiplier. Autoplay can be set for up to 500 spins. It may also be set to stop on a win of a certain amount. The side bet will always be placed.